These dark amber brown tinted dropper bottles are among the best for storing eJuice. 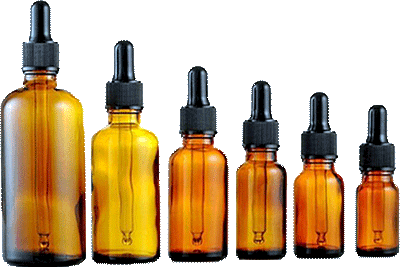 The amber tinted bottles maximizes the freshness of your eJuice and greatly reduces the amount of UV sunlight which may come into direct contact with your vape liquids. Sunlight can quickly deteriorate your delicious flavors. If you yourself have been a "vapor" for any length of time, than surly you have experienced what happens to eJuice when accidentally forgotten in a hot vehicle. When exposed to UV light, over time your eJuice will begin to darken in color, and prolonged direct sunlight can even make your ejuice 100% black in color quite quickly. While technically and "arguably" vape juice has no expiration date, if over exposed to heat and sunlight, it can make your Flavors black and Taste like.....crap. These amber tinted empty ejuice dropper bottles will give your vape juice an extra layer of protection, think of it "like a sun screen for your eJuice" Its great to have but you should also always try to keep your e liquids away from direct sunlight and extreme heat regardless. - Keeps your flavor fresher for longer!